A critical success dimension in projects is the ability to complete a project within an estimated duration. In that regard, effective project scheduling techniques in an uncertain environment is of interest in many organizations. In this paper, the authors use an analytic approach to analyze the behavior of time duration distributions of projects in stochastic activity networks, and propose a simple computation scheme for approximating their distribution. The findings offer an understanding of the large gap between PERT and simulation results, and the deviation of projects from their intended schedules. 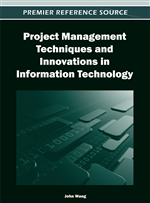 In addition to providing theoretical framework, the proposed approach also recommends a simple practical pragmatic technique that computes the time distribution of project duration. This is a simple and handy tool for the project manager that may replace simulation. As a byproduct, the earliest start time distribution for each activity is also estimated. Scheduling is a core project management area, and finding project's duration (makespan) is one of its important objectives (Kerzner, 2006; PMI, 2008; Zwikael et al., 2006). This paper presents a practical technique that estimates the makespan distribution of a project in a more accurate and reliable way than PERT (Project Evaluation and Review Technique), and is consistent with Monte Carlo Simulation results. One of the most common techniques for project scheduling under uncertainty is PERT, which was originally proposed by Malcolm et al. (1959). While it is still a prevalent planning and controlling tool in project management (Ash & Pittman, 2008; Adler & Smith, 2009), it has been critiqued that PERT provides inaccurate information about the project completion time (e.g., Klingel, 1966; Shogan, 1977; Schonberger, 1981; Dodin, 1985; Schmidt & Grossman, 2000; Dodin, 2006; Hahn, 2008; Kirytopoulos et al., 2008). Alternatively, Monte Carlo simulation has been a practical tool for evaluating the makespan distribution of a stochastic project (e.g., Van Slyke, 1963; Burt & Garman, 1971; Sullivan et al., 1982; Iida, 2000; Demeulemeester & Herroelen, 2002; Kirytopoulos et al., 2008). However, the simulation computational intensity and the time consumed by a simulation, motivated research for searching alternatives (Adlakha & Kulkarni, 1989; Cohen & Zwikael, 2008; Salaka & Prabhu, 2008). While several research directions had been pursued (as discussed in section 1.1.) there is still a need for a practical technique that would replace PERT and would give consistent results with Monte Carlo Simulation.